Earlier this week we showed you—nay, warned you—that the police now have a Nissan GT-R. The police in Japan, admittedly, but it’s a car so outrageously fast, it could quite easily reach miscreants on other continents before they’d had the chance to get away. Well, the British police now have their hands on something even quicker. It’s a two-wheeled car named Ducati Panigale V4, and it sees Japan’s GT-R and laughs. Its 211hp has a mere 198kg to carry (pre-policeperson, presumably), giving it a power-to-weight ratio beyond a Koenigsegg’s, resulting in a top speed north of 306kph. On something you can quite easily fall off, remember. 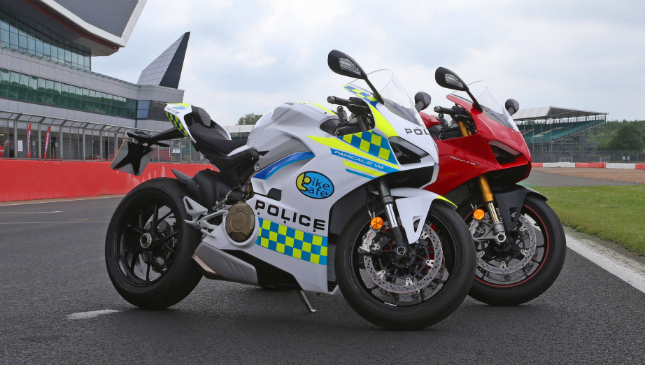 BikeSafe’s police Panigale works more as a publicity thing, it seems, and they’ve taken it along to a trackday at Silverstone to really prove their “riding should be fun” mantra. That’s our kind of policing.